OMAHA, Neb. (AP) Ohio coach Frank Solich, whose firing at Nebraska is still debated among fans 15 years later, will return to the state this winter to receive a service award from the Football Writers Association of America. 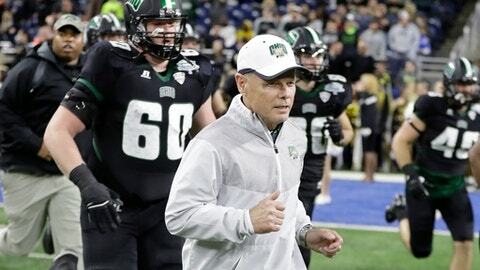 The organization announced Friday that Solich would be presented the Tom Osborne Legacy Award at the Outland Trophy banquet on Jan. 9 in Omaha. The FWAA said Solich has agreed to come to the event, which will be one of his few public appearances in the state since he was dismissed in 2003. Solich was an All-Big Eight fullback at Nebraska in the 1960s, a longtime assistant to Osborne and a winner of better than 75 percent of his games as head coach. The Tom Osborne Legacy Award is presented to a person who, in part, exhibits the integrity, sportsmanship and fair play associated with the Hall of Fame coach who led the Huskers to 255 wins and three national titles in 25 seasons. Solich did not immediately return phone messages. Solich’s return is seen as another step in the reunification of the Nebraska football family. Solich was the last coach to lead the Huskers to a conference championship, in 1999, and none of the three coaches who followed him lost fewer than four games in a season. Osborne, along with new coach Scott Frost, began discussions about acknowledging Solich’s contributions shortly after Frost was hired in December. Frost was Nebraska’s starting quarterback in 1996-97 and helped the Huskers send Osborne into retirement with his third national championship in four years. Solich was Osborne’s hand-picked successor, and he went 58-19 from 1998-2003. The 2001 team played in the BCS title game, losing to Miami, despite a 62-36 loss to Colorado in the final regular-season game. The Huskers have gone 113-68 overall and 66-48 in conference games the last 14 seasons. Solich was named head coach at Ohio in 2005 and has a 97-71 record in 13 seasons.